There hasn’t been much time for stitching of any kind around here in the past couple of weeks, but I did have time for a quick (well, quick for me) finish. 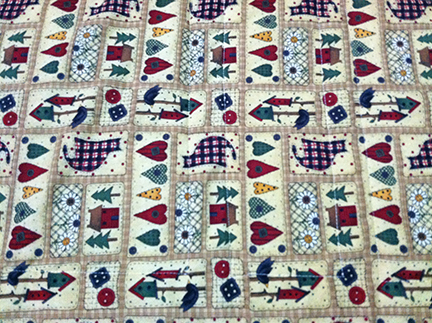 Several years ago, a dear friend gave me some flannel fabric, including a cheater panel and some complementary fat quarters. Taking a look at them last weekend, I decided they would be a good combo for a baby blanket. 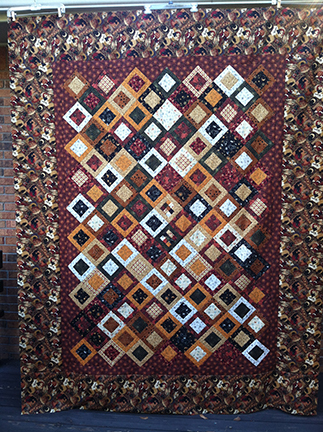 The back is regular quilting cotton I had left over from another project I made and had already washed, so I serged around the edges of the front piece so they wouldn’t fray; then I washed it to minimize shrinking.This way both pieces would work well together. My biggest challenge — again — was the basting and keeping the back from getting pleats. I used some Elmer’s craft adhesive that I thought would make things easier, but it didn’t. Next time, I’ll go back to pin basting. 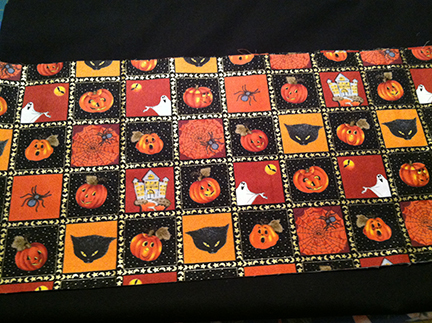 The finished size is about 40×46 inches, perfect for a baby or toddler to drag around. Hope you’re all having a wonderful weekend. I’m going off to finish my lovely cup of tea and work on my knitted baby blanket. I hope I’ll have a finish on that for you soon. So, remember the knitting I did a few posts back that looked like this? This is my first time felting with garter stitch and I have to say I like it. 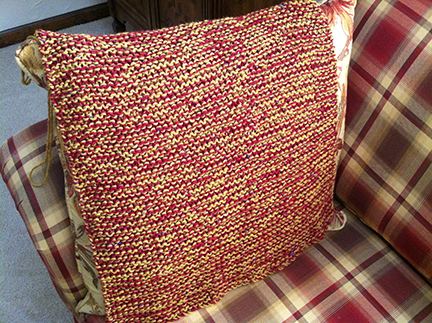 The texture has a chenille look to it from the ridges the stitch creates, and using the two colors stranded together gives it a variegated appearance that’s really pretty. Next, I’ll trim the edges so it lays flat and either do an edge stitch of some kind, like a blanket stitch, or I’ll do a quilt-like binding. Either way, it’ll be a great potholder for someone this holiday season. 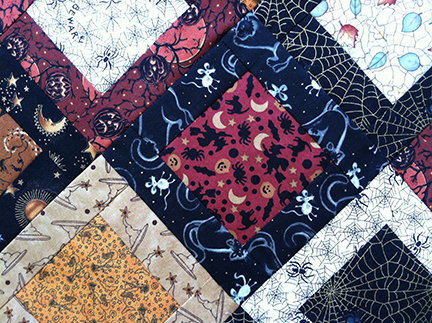 I’ve just started a new group on my flickr page with my Halloween quilt to start. If you’ve got a WIP you’d like to share, link it up here! It’s a bit nippy out this morning, and the scent of fall is in the air. It’s the perfect time to start thinking about delicious pumpkin recipes and Halloween. 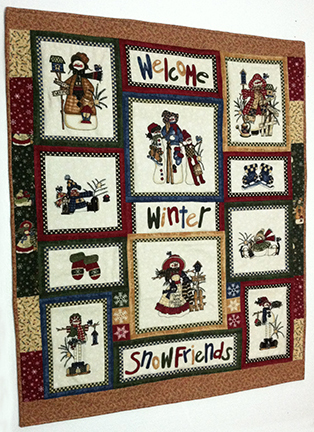 I started this quilt top last year about this time and unfortunately, didn’t get it done in time for the holiday. I hope to rectify that this year with a new basting method I learned on YouTube. Here’s another view where you can see the whole thing. Doesn’t it look great against the brick facing on my house? 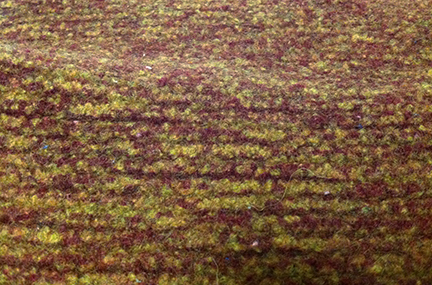 Here’s a photo of the border, which was my inspiration fabric. It was just too cute to pass up. The back is definitely going modern. 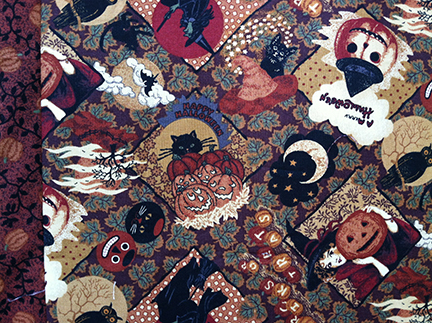 I’ve got some leftover Halloween fabric that wouldn’t have worked for this muted, 1930s-style top, but it’ll be great on the back against a solid black background. I plan to quilt it in a grid pattern on the diagonal, but I haven’t decided yet if I’ll stitch in the ditch along the seam lines, or if I’ll go out 1/4-inch. 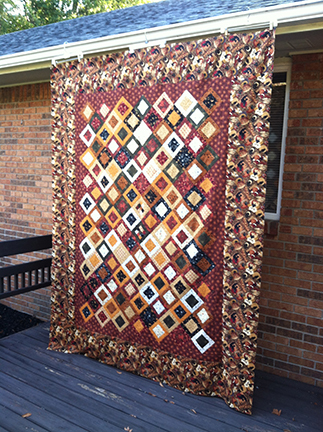 I’ve seen Rita of Red Pepper Quilts finish a lot of her quilts that way, and I really like the look. If the new basting method (new to me) works, I’ll tell you all about it soon. Until then, thank you so much for visiting. I really appreciate each and every one of you! 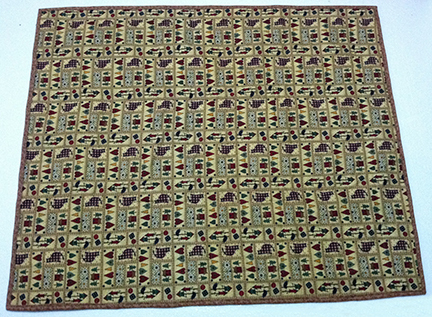 I haven’t had much time for any kind of stitching this week, other than some mindless knitting in front of television. The knitted baby blanket I started a couple of weeks ago is perfect for this. Oh yes, I did manage finally to get my new header up. Better than the old one, I think, although I wish I could figure out how to get rid of the gray line on top. Anyone have any answers for that? Since this is destined for charity, mostly likely Project Linus, which donates handmade blankets of all kinds to seriously ill or traumatized children, it needed to be something washable. The blue is some Emu Superwash I had in my stash; the yellow is an unlabeled acrylic. I’m knitting it on size 8 29-inch circular needles. I really like using circular needles for things like this so my arm won’t get tired holding the stitches as the piece grows. These are made or bamboo, which are my favorite. I know some knitters don’t like them because they’re slower, but I like that they’re quiet, and because they hug the yarn a bit, I can get the stitches really close to the edge and not worry about them easily slipping. If only that meant I was a faster knitter. So not the case. While the original pattern is done with one color, and I knew I didn’t have enough of the blue, I decided I could get away with knitting the middle rows of garter stitch in another color. 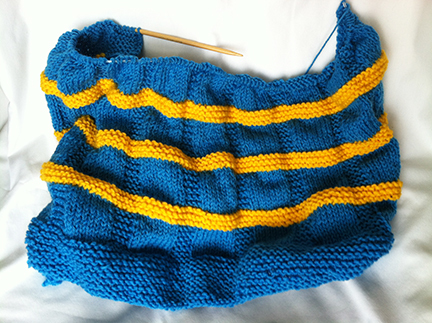 Unfortunately, I’m not sure that I still have enough blue (even though yardage wise it should have been), so I’ll either add more yellow in the middle, or maybe even add some white, which would work nicely. 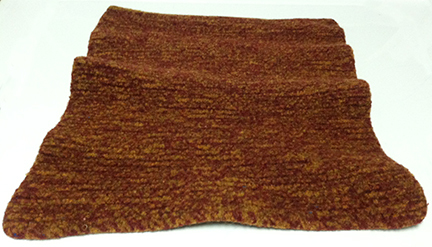 I hope to have my felted potholder done later this week — can’t wait to show you!